Nesting season has begun in New York City. This picture of a pair of European house sparrows, Passer domesticus, shows off the adaptability that helps theses birds live among humans so successfully. They'll make nests in natural cavities like holes in tree trunks, but also will readily move into man-made spaces like the hollow pipe the female on the right is sitting inside. The pipe holds cables that suspend a traffic light over Broadway in Manhattan. 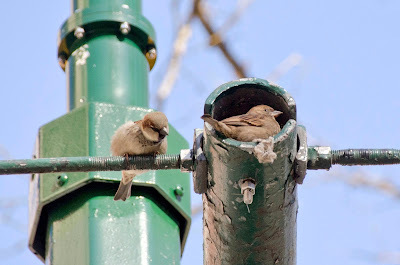 All over the city, males like the one on the left are defending traffic light cavities just like this one, and fights among males often break out around the streetlights in early spring. Females sparrows visit while the male nest-owner chirps and hops nearby, hoping a female will move in. This female looks pretty comfortable and might be thinking of how to decorate the interior with grass and fluff to make it a perfect dream nest. Looks like a match has been made. Click to enlarge. 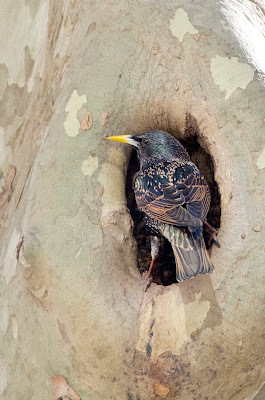 Meanwhile, in Central Park, this European starling, Sterna vulgaris, has found a very nice natural cavity. Before long all the nest-worthy spots in the city will be full of cheeping nestlings.